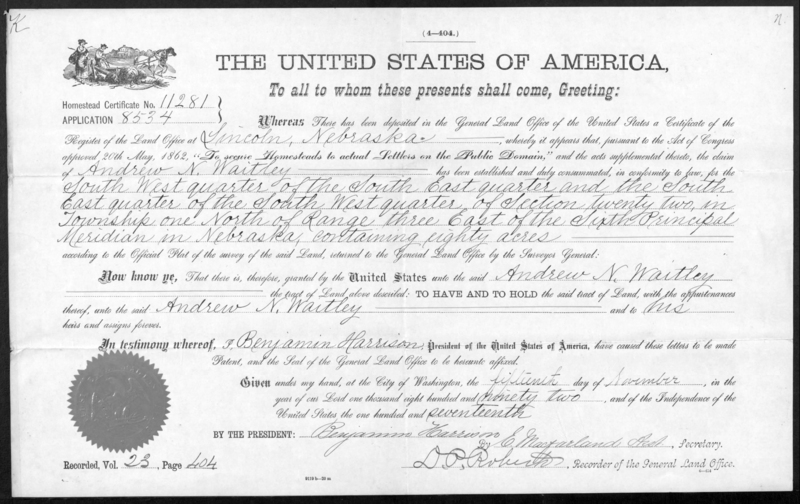 The Nebraska Homestead Final Certificate Case Files are now digitized and available to the public after a decade of planning, preparing and executing an initiative to bring these records to the public. The records, amassed by the General Land Office, were used to ensure that those who claimed a portion of the public domain through the Homestead Act of 1862 met the requirements of this law. Forty-five percent of all land in Nebraska was distributed to homesteaders, the highest percentage of all 30 homesteading states. Twenty-one land offices from Omaha to Chadron served Nebraska land claimants. The records are documents filed by homesteaders and describe their property improvements, including houses constructed, wells dug, crops planted, trees cleared and fences built. The case files include records of military service, evidence of naturalization and much more. This project was made possible through a partnership of the University of Nebraska-Lincoln, Family Search, Fold3.com, Ancestry.com, the National Archives and Records Administration, and Homestead National Monument of America. The case files preserve material of considerable historic and genealogical significance. Family historians and scholars alike said they have found the records to be exceptionally useful. Virtually all Homestead Final Certificate Case Files from the 30 homesteading states have survived and are held by the National Archives and Records Administration in Washington, D.C. In the Nebraska series, there are 76,871 files containing more than 1.6 million digital images. This database can be searched and viewed for free at Homestead National Monument of America near Beatrice, UNL libraries, National Archives and Records Administration research centers nationwide and Family History Centers at several locations across the country. Go to https://familysearch.org/locations/centerlocator for locations. The records can also be accessed for a small fee at Fold3.com or Ancestry.com. For more information, go to http://www.nps.gov/home/historyculture/homesteadrecords.htm.